Forward pumping means that the pump wave travels in the same direction as the signal wave. Backward pumping means that the pump wave travels in the opposite direction. One can also pump in both directions simultaneously; this is called bidirectional pumping. Figure 1 shows a bidirectionally pumped fiber amplifier. Radiation from the left laser diode for forward pumping is combined with the input signal, using a dichroic fiber coupler. After the active (erbium-doped) fiber, there is a second dichroic coupler for injecting light from the second pump diode in backward direction. The same coupler also prevents any residual pump light from getting to the signal output. Figure 1: Schematic setup of a simple erbium-doped fiber amplifier. Two laser diodes (LDs) provide the pump power for the erbium-doped fiber, allowing it to amplify light with wavelength around 1550 nm. Two pig-tailed Faraday isolators strongly reduce the sensitivity of the device to back-reflections. In the following, we look at various technical details which partly result in advantages for some pumping direction. The overall gain depends only on the average excitation density along the fiber. The total pump absorption efficiency also depends only on that average. The same holds for the amount of power lost via fluorescence (spontaneous emission). All this holds also for quasi-three-level laser transitions, and of course also for bidirectional pumping. 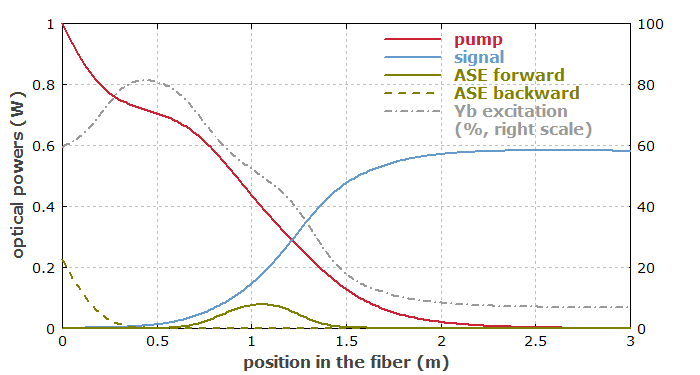 If the fiber has substantial parasitic losses, backward pumping is more efficient. This is because the signal is strong near the pump input end, holding the excitation density down in that region, so that the pump light is efficiently absorbed by the ions before parasitic losses can get it. In certain situations, bidirectional pumping may be even more efficient. However, most amplifiers are only a couple of meters long, and parasitic losses within that length are not very important. We have already seen in part 4 that without a signal input, ASE can be much stronger in backward direction. Not surprisingly, that asymmetry does not vanish if we also have a signal input, and the amount of ASE – which constitutes a power loss – can substantially depend on the relative direction of signal and pump light. Figure 2: Optical powers along the length of an ytterbium-doped fiber amplifier with forward pumping. Figure 3: Optical powers along the length of an ytterbium-doped fiber amplifier, now with backward pumping. We see that ASE is now negligibly weak, and we obtain 346 mW of signal output power instead of only 290 mW. The ASE spectrum (not displayed here) only shows some weak ASE around 1030 nm and much less around 975 nm. 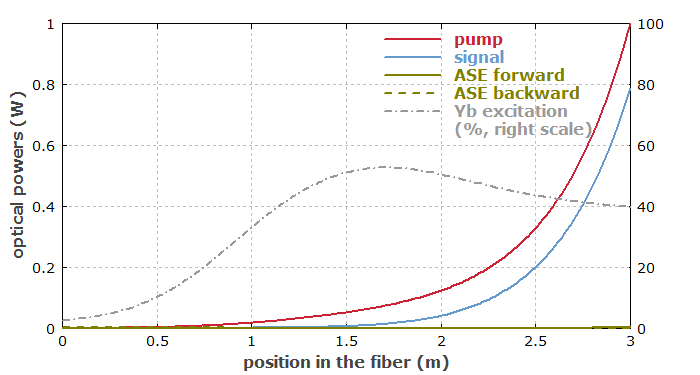 Positive net gain at 975 nm occurs only in a short region of the fiber around 2 m from the left side. These findings are quite typical. Generally, quasi-three-level fiber amplifiers have lower ASE losses for backward pumping, and therefore a higher power conversion efficiency in that configuration, if ASE losses would otherwise be significant. For higher input signal powers, causing stronger gain saturation, the difference between the two directions is smaller. Another aspect is that ASE which propagates together with the signal constitutes a broadband noise for that signal. For backward pumping, the ASE propagating in the same direction as the signal is generally stronger for quasi-three-level systems – even if the total power loss by ASE is lower! So for low-noise operation, forward pumping is better, despite the possibly lower efficiency. If we amplify short pulses, nonlinear effects are often detrimental. This will be discussed in part 7, but here it should be mentioned already that backward pumping is often much better. The reason is that for backward pumping, the pulse energy and peak power initially rises more slowly, so that the spatially integrated peak power gets lower for a given output peak power. Go to Part 6: High-power Fiber Amplifiers with Double-clad Fibers or back to the start page.